For this route, I will go into more detail to establish the pattern and explain how the charts work for new readers. The MonthHeadways charts linked here illustrate the range of values of headways and the degree to which day-to-day values follow a similar pattern. 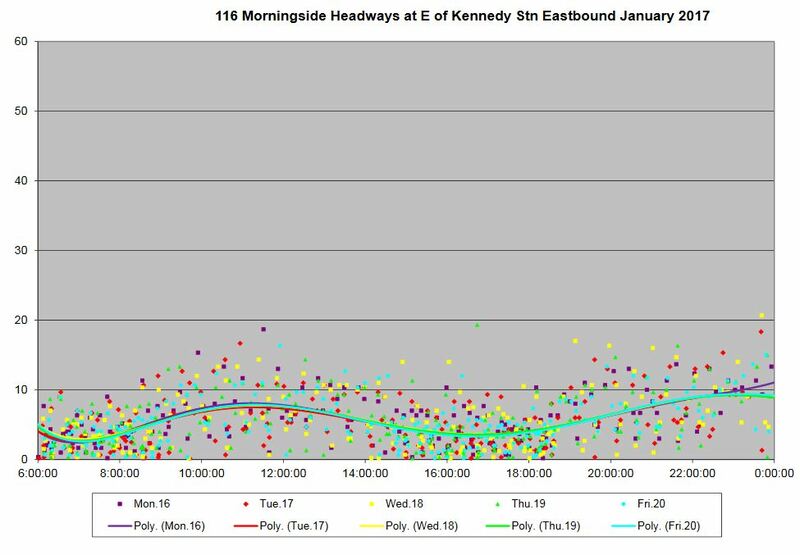 Here is the chart for service leaving Kennedy Station in the third week of January. the colours indicate the day of the week. time of day (horizontal) of the vehicle. Trend lines are interpolated through the data to show the overall movement of values up and down through the day. The source data come from the TTC’s vehicle tracking system (CIS) and include all vehicles on the route. Generally speaking, the trend lines follow the scheduled headway through the day, and with all of these lines resting more or less on top of each other, it is clear that overall the service follows the same pattern through the week even though some days can show different patterns than others. 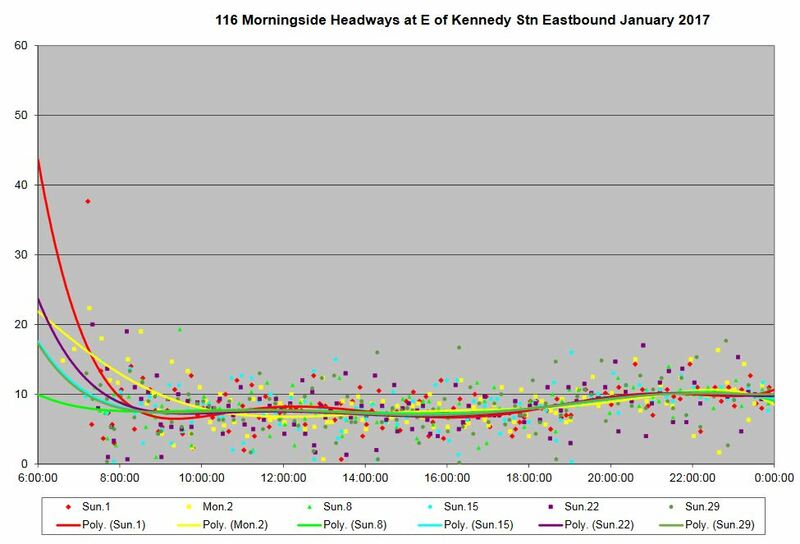 Note in particular that if the headways become more spread out, but all buses are present, then the average will stay the same and so will the trend line. For example, Wednesday January 18 (yellow dots) shows more spread out values particularly in the afternoon and evening. During all hours of service, the scheduled headway is 10 minutes or better, and by the TTC standards, this allows a variation of up to 50% of the scheduled value (even more in periods when it is below 5 minutes). The lion’s share of the data lie within these bounds, the service riders will experience is affected by the up and down of headways. All of the dots near the zero line are buses operating immediately behind their leader, in other words, a bunch. This is the service as it originates from the terminal, and it is clear that buses leave more or less when they feel like it with little regard for the schedule. This is permitted by the lax nature of the standards. Similar charts are provided for Saturdays and Sundays, with the New Year’s Day holiday (Monday the 2nd) included as a Sunday. 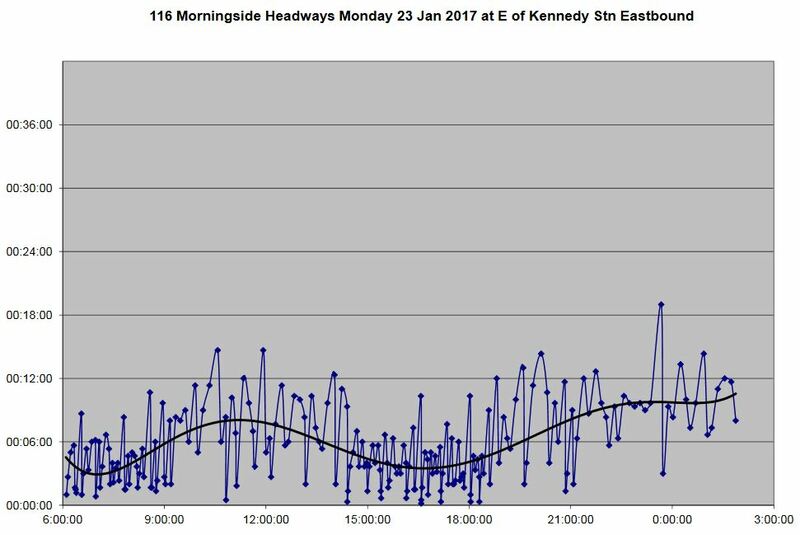 In the Sunday charts, the trend lines swing up at the left because frequent service does not start until after 7:00 am. Although the values here stay clustered around the average, many still lie well away from it and very short headways are not uncommon. The problem, as it relates to the standards, is a dual one: the acceptable window of headways is too wide, and the goal of achieving this only 60% of the time provides plenty of room for exceptions. Over one third of the service can be completely off schedule, but the line meets the “standard”. Also included in the sets of charts are mean and standard deviation (SD) values for the monthly data, subdivided by weekdays, Saturdays and Sunday/Holidays. The SD gives an indication of the dispersion of the values around the mean, and in most cases, two-thirds of the values lie within one SD of the mean value. If the SD value is, say, 3 minutes, then 2/3 of the headways lie ±3 minutes of the mean. This is not the same as the +1/-5 range used in TTC standards for infrequent services, nor is it the same as the percentage variation allowed for frequent routes. However, it does give an indication of how closely a service actually operates to the mean headway which, except for very unusual circumstances, will equal the scheduled headway. Note that these values apply to a range of hours, and the point where a route will transition from one period to another depends on the schedule design. When the SD and the mean are close together, there is a very good chance that service will be bunched. In the chart below, when the headway is supposed to be 3’30”, there is a good chance that this will actually be pairs of vehicles running close together on a wider spacing. One can look at the data in greater detail to see how headways evolve along a route. I have omitted these charts for this article but wanted to include a few to demonstrate the problem arising from irregular service right at the route’s origin. 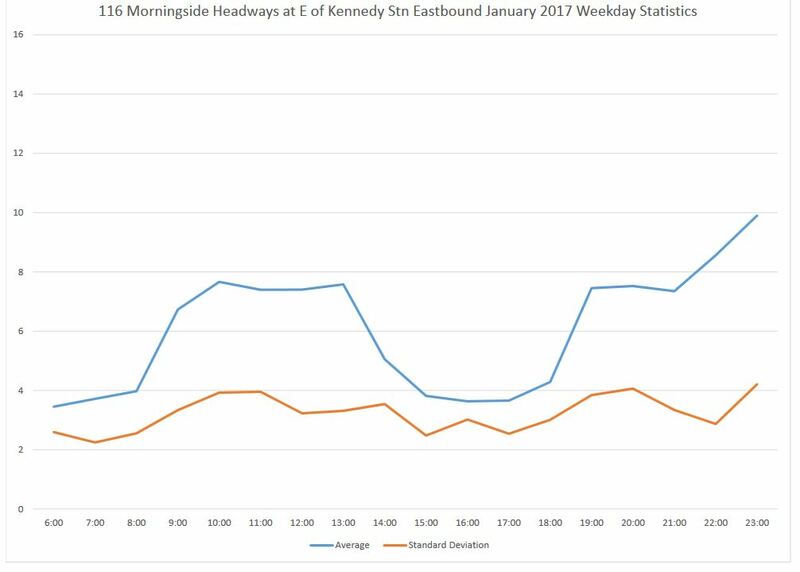 The chart below shows the data for buses leaving Kennedy Station on Monday, January 23, 2017. This is not a service that riders would deem to be “reliable” considering how often buses run close together with correspondingly wide gaps. Bad as this looks, it is a typical chart of this type for TTC service. If one steps through the pages of charts within the Headways files, one can see how the peaks and valleys evolve along the route, and the effect as short turns (scheduled or otherwise) drop out of the mix. 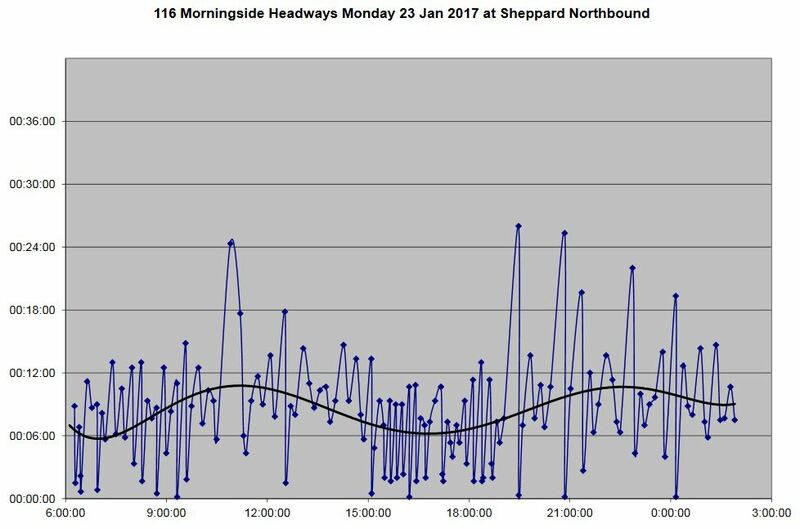 The chart below shows the same day by the time buses arrive (if they do) at Sheppard and Morningside northbound. Waiting over 24 minutes for a bus, especially when two are running as a pair, is simply unacceptable. Lest there be any delusion that all this gets fixed out at the terminal and service is beautifully close to schedule inbound, here is the southbound service returning from the loop at Staines Road. Scarborough is a twin of Morningside in that they share the inner part of their route and are scheduled to have blended headways during the less frequent periods of operation. Like Morningside, Scarborough runs with erratic headways, and this makes any true blending impossible. I will explore this in more detail in a separate article on these two routes. Service eastbound from Kennedy Station shows the same pattern of dispersed headways and much bunching, except on Sundays when the headways stay tightly clustered around the mean value. This is reflected in low SD values for these days. It is possible to have properly spaced service, just rare. 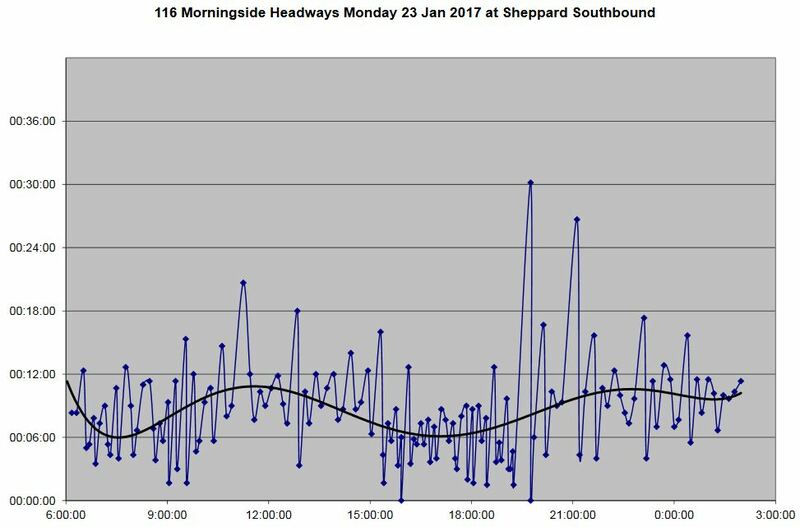 Service southbound from Sheppard is similarly erratic, although again with better behaviour on Sundays than other days of the week. Service westbound from Starspray Loop shows the same characteristics seen above, but at a grander scale because this is a branch at the outer end of the line. Weekend service is appalling, notably on Sunday when gaps of half an hour or more are common, and the SD values lie in the eight minute range. By the time the westbound service reaches Markham Road, it has been joined by the Orton Park short turns. Headways are still scattered over a wide range, but not as severely as at the east end of the line. The weekday SD value runs close to the mean, particularly during peaks, indicating that buses tend to run in pairs. An important issue for branching routes is that they merge together with truly “blended” services, but there does not appear to be much attempt to make this actually happen. Eastbound service at Midland (east of Lawrence East Station) also shows erratic headways even though the RT station would provide a convenient point to dispatch buses and “reset” headways arriving from further west on the route. Similarly, westbound at Kennedy (the other side of Lawrence East Station) shows headways that indicate no effort at bringing back some regularity. York Mills shows all of the characteristics seen on other routes, and it has particularly bad Sunday service particularly outbound from York Mills Station. Sheppard East has two separate segments, with the major one running east from Don Mills Station to Rouge Hill Station. Meadowvale is a turnback point for some service with the through runs continuing to Rouge Hill GO. Service from Rouge Hillis infrequent. Although it can be well-behaved at times, at others there are very wide gaps and occasional short headways. By the time we reach Meadowvale and pick up the more frequent service, headways are better (although not ideal) on weekdays. On weekends, particularly Sundays, they are badly scattered. This could well be due to the problem of poorly blended services, but I will leave that to a more detailed review of the route. Eastbound service from Don Mills Station is better behaved with SD values regularly in the 2-3 minute range. This is not ideal, but far better than the westbound service. West from Don Mills to Yonge is a surface bus intended to supplement the subway for local stops and for riders who find getting to a subway station difficult. The service does not operate frequently, and tends to be more reliable eastbound from Yonge than westbound from Don Mills. Finch East runs a split service with some runs going through to Morningview Trail, but most turning back further west. The charts below show service at the outer end of the line, and at Markham Road inbound. From the terminal, headways are badly scattered, and SD values of five minutes or greater are not uncommon. Further west at Markham Road, the service is a bit better, although Saturday evenings are something of a mess with erratic headways. Outbound from Finch Station, off peak headways are somewhat better behaved, but the peak period sees many buses operating in bunches. With a scheduled AM peak headway of 3′ and PM peak of 4′, the 75% target factor leaves a fair amount of room for “acceptable” bunching. On a 3’00” headway (180 seconds), a deviation of 2’15” (135 seconds) is allowed. On a 4’00” headway, the deviation can by up to 3’00” and still fall within the target. Having said that, there is a point below which dispatching “on the clock” (even assuming there is any dispatching at all) will not do much to prevent buses from running together if only because the traffic signal system will marshall them into multiples of the cycle time. Bathurst buses leave Steeles southbound on an already-erratic headway with SD values typically of four minutes. For a route that is supposed to be part of the “ten minute network”, the headway leaving the terminal is smeared out over a wide range. The situation is not quite as bad northbound from Bathurst Station where the weekday offpeak has an SD running at about 3 minutes. The service, however, is hardly running like clockwork. There is a particular irony in the behaviour of this route because TTC staff at Hillcrest are subject to this service every day. Note that the lower-than-normal headway on the weekend of Jan 21-22 is due to the extra service operated in parallel to the Spadina subway which was closed for signal testing. Note that even with (or possibly because of) the extra service, there is a fair amount of bunching. There is little new in the Dufferin charts compared to previous analyses of this route. Buses leave from both terminals over a range of headways that fit with the standards, but which produce erratic service with a lot of bunching right from the ends of the line. The Keele bus has been subject to a great deal of disruption during the TYSSE construction, and to a lesser extent by the Crosstown work at Eglinton. Headways from both ends of the route vary substantially from the average with bunching and wide gaps common. Finch West, as we have seen in previous analyses, typically runs with varying headways and a lot of bunching, particularly in the latter part of weekdays. This situation applies to service in both directions. An important issue for both Finch and Keele is that these routes are coming out of a period where construction delays would have been used to justify simply making do with whatever service happened to operate. This can easily become an accepted practice even as conditions improve, and the results for January suggest that nobody is minding the store to ensure service reliability on these routes. I included the Bay bus here because this route was plagued with congestion during the reconstruction of Front Street and Union Subway Station. That work is now completed, but headway reliability from both ends of the line is unreliable particularly in the offpeak and on weekends. For years, this route carried heavily mainly between Bloor Street and the government/university area north of College. South to the lake was a comparatively sleepy run. Now, with George Brown College on Queens Quay (the bus loops at the building), there is a new demand that previously did not exist. However, the quality of service actually provided to the campus is at times not an encouragement to use transit. This entry was posted in Bathurst Bus, Bay Bus, Dufferin Bus, Finch East Bus, Finch West Bus, Keele Bus, Lawrence East Bus, Morningside Bus, Scarborough Bus, Service Cost and Quality, Sheppard East Bus, Transit, York Mills Bus. Bookmark the permalink. Maybe to map all these into bands arrived early and leaves (-3, -2, -1, 0, 1, 2, 3, 4, 5+) minutes later than it should….I’d say a measurement of good management would be that it’s a bell curve on 0….but I doubt we’d see that. Steve: The problem for me is that to produce such a report, I would need the schedules of all of the runs. Being “on time” is a simplistic view of actual headway management, especially on routes where service routinely runs off schedule (streetcar lines) and headway is far more important to riders than on time performance. When a bus is scheduled to arrive every 3 minutes, do you care which one it is? My interest is far more in headway regularity than schedule adherence. Something that does show up in a different plot not included in this article is the length of time spent at a terminal. It is not uncommon to see vehicles leave on varying headways after layovers of varying lengths. To put it coarsely, “I’ve had a long enough break and suppose it’s time to go”. This behaviour is aided by the padding in schedules that means ops either have to dawdle to stay on time, or know they can take extra layovers and then get back “on time” enroute. Given what is considered an acceptable variation from schedule and headway, this means the behaviour does not trigger any flags. Exactly, and if we are looking at a route like that – departing on time, should be based on the minutes after a previous run. I have an easier time understanding why this would not be the case on a route where the buses are scheduled at 15 minute + intervals, where there are specific times they are supposed to be at a stop. However, when you are supposed to have a headway of 7 minutes, and you are looking at times where it is nearly 3 times this. The impact on the perceived viability of service must be extreme. There needs to be a system that both tracks the time of departure of the previous bus, and communicates this. There should not be situations where you have 3 buses leave in 10 minutes on a 7 minute headway, unless it is to address a known load.